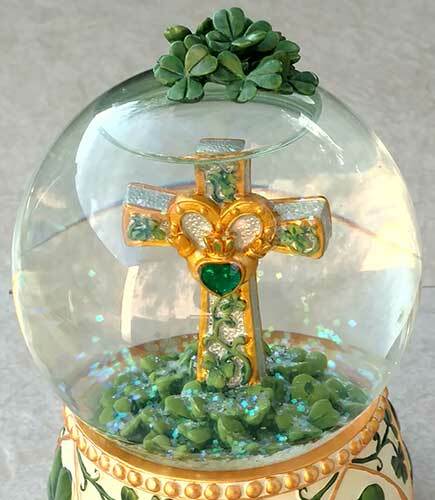 The Irish Gift House features Claddagh rings and Celtic crosses. 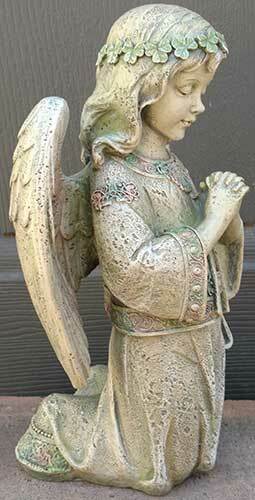 Claddagh rings, Celtic crosses and Irish jewelry + delivery in 2 - 3 days. 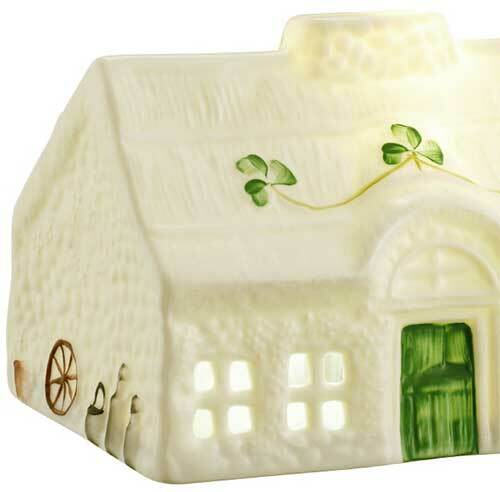 Belleek and Celtic jewelry are included in our extensive variety of Irish gifts. 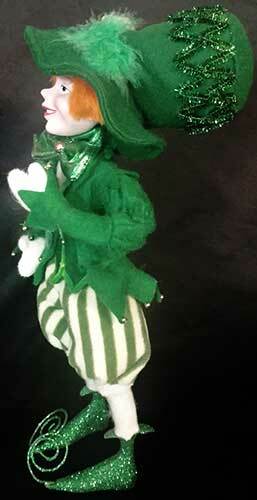 Irish Gifts for every occasion, along with a wealth of Claddagh Jewelry and Celtic Wedding Bands. 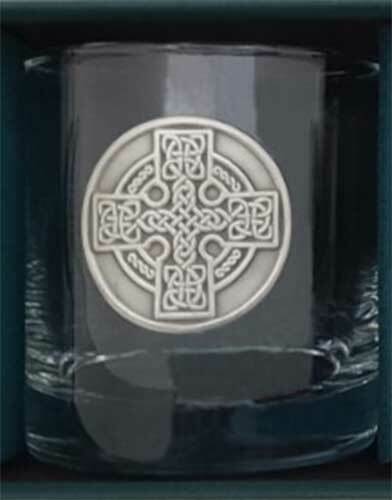 We are also a market leader serving the strong demand for Celtic cross necklaces by providing a vast range that incorporates styles for both men and women. 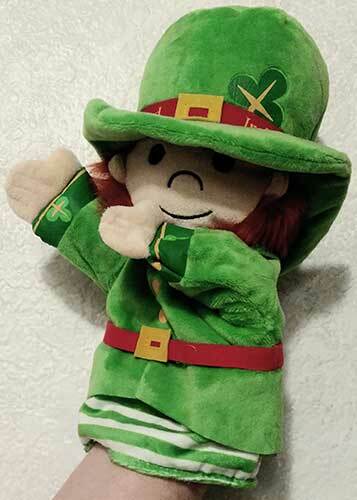 If you are searching on-line for Celtic necklaces and earrings, along with knot-work bracelets, you have found the right place as we have a vast collection that is proudly made in Ireland. 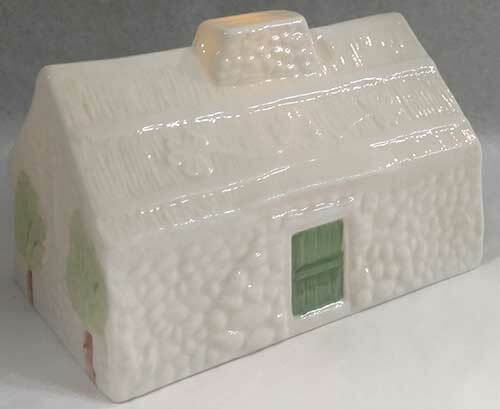 You may buy with confidence from the family owned and operated The Irish Gift House that is now in our 24th year of business with over 35,000 satisfied customer transactions. We encourage you to take a look at our 5 star Google reviews. Our site provides you with the highest levels of encrypted protection with our positive SSL security; just click on the lock icon in your browser bar for certified information. Typical orders ship Priority Mail through the USPS so the normal delivery time for most orders is only 2 to 3 days anywhere in the United States. 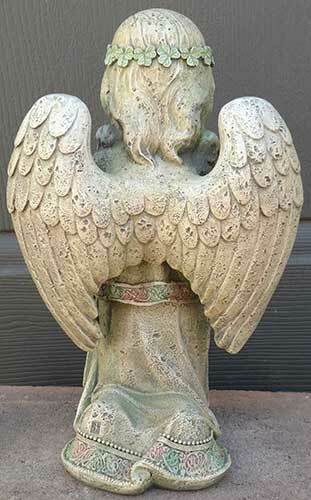 You will receive free shipping on orders of $99.00 or more, or discounted shipping on orders of $49.00 or more. And here is one more plus; there is no sales tax on most orders. 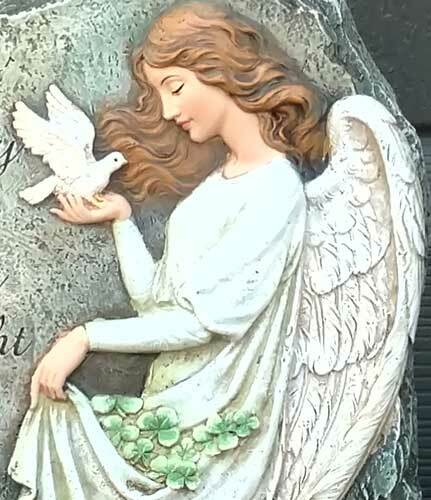 Our over 9,000 Irish gifts feature the fabled Claddagh rings along with iconic Trinity and Tree of Life jewelry selections, but please also see our Connemara marble jewelry and Galway Crystal to capture the true depth of our diverse assortment. 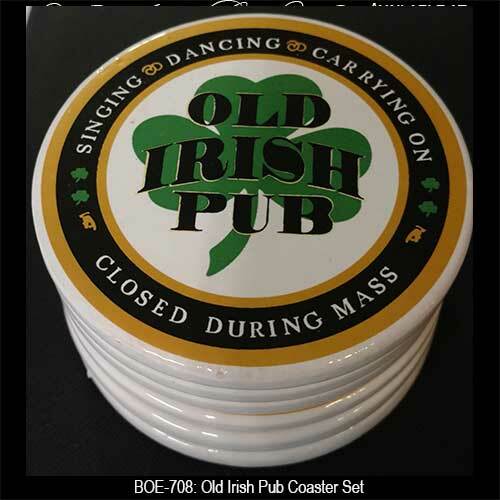 Our variety of Irish gifts ranges from the traditional to the contemporary and includes classics such as Mullingar Pewter and Irish blessing plaques with everything in between that are sure to make your Irish eyes smile. 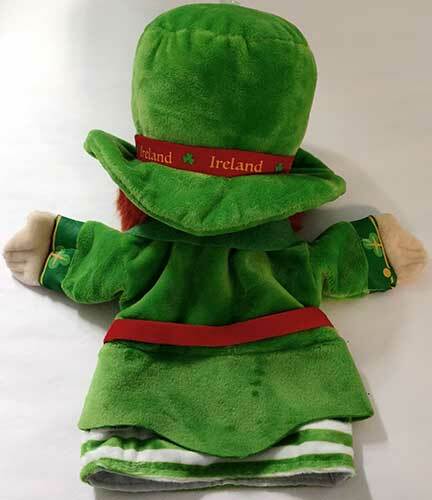 Browse our collections that include Irish baby gifts and Irish wedding gifts for all of life's events; additionally, we have just what you need for every occasion with Irish Christmas decorations along with selections for Valentine's Day and St. Patrick's Day. 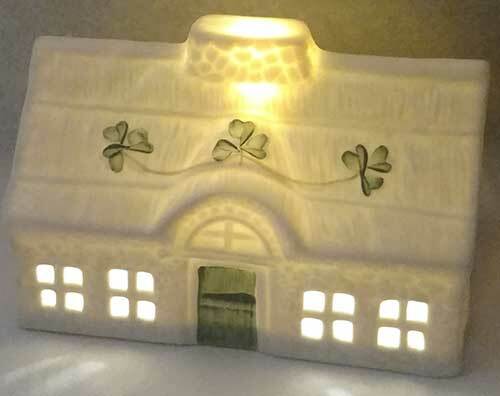 The Irish Gift House is a real mom and pop shop; it is just the two of us, Kerry and Andrew, and we are pleased that you visited us on-line today. 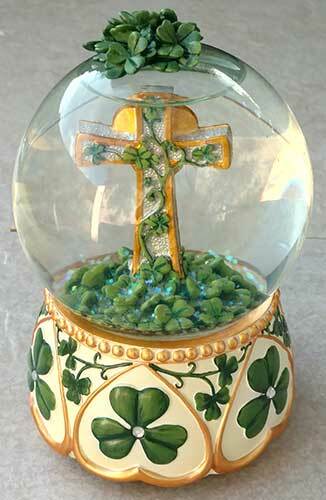 Please scroll down to browse our newest assortment of Irish gifts and Celtic jewelry. 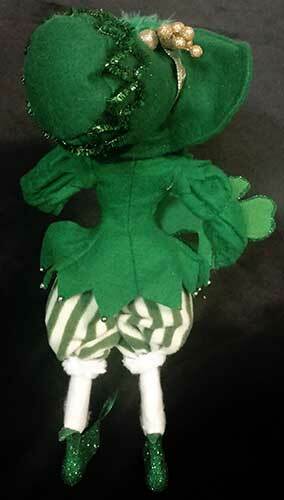 You will find our main category headings in the green bar toward the top of the page. 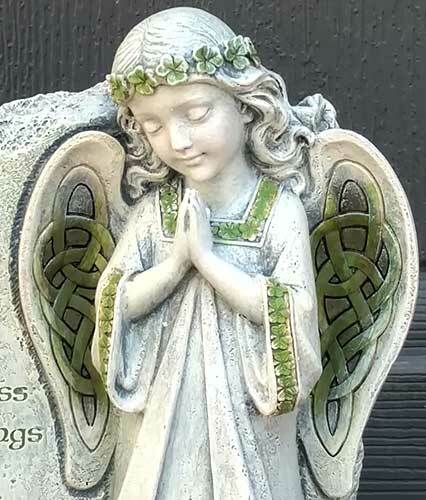 Irish angel for your garden is knelt in prayer. 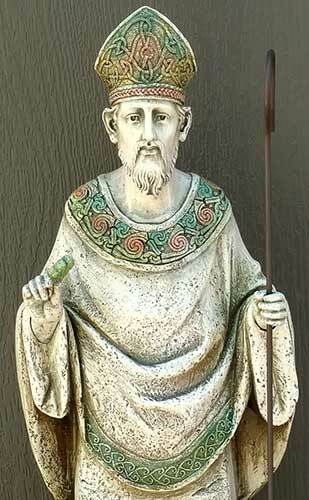 Irish garden statue features St. Patrick who is enhanced with Celtic knot work and a shamrock, along with an Irish blessing and a staff. 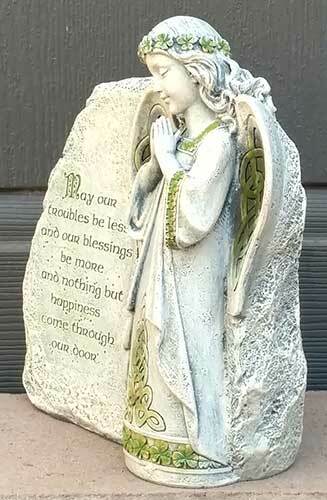 Celtic angel features a garden stone with an Irish blessing along with shamrock and knot-work accenting. 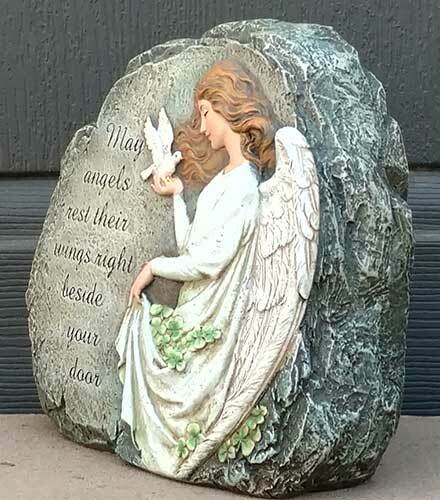 Irish garden stone features an angel along with a blessing and shamrocks. 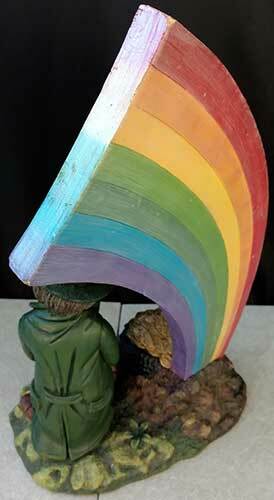 Irish garden statue features a leprechaun on a Celtic knot enhanced toadstool that features solar LED illumination. 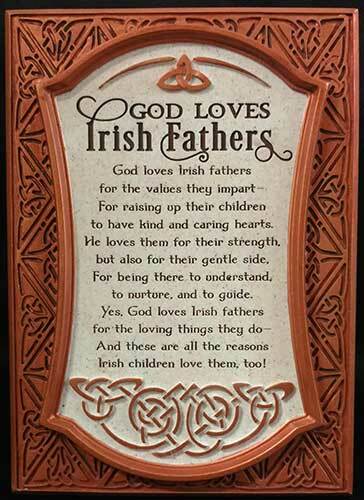 Irish blessing plaque is a wooden design that is enhanced with shamrocks. 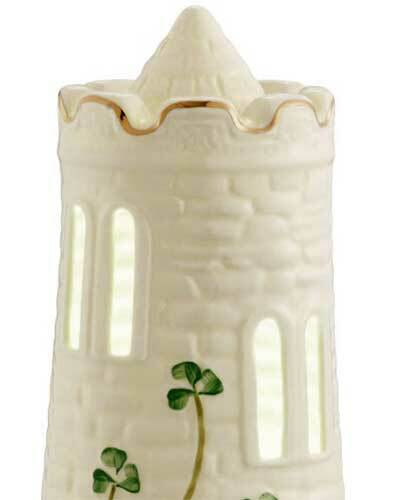 Belleek castle is a fine china design that is illuminated by LED light. 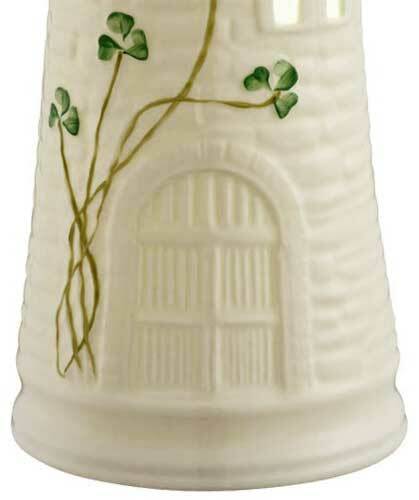 Belleek Blarney Cottage light is a fine china design that is illuminated by LED. 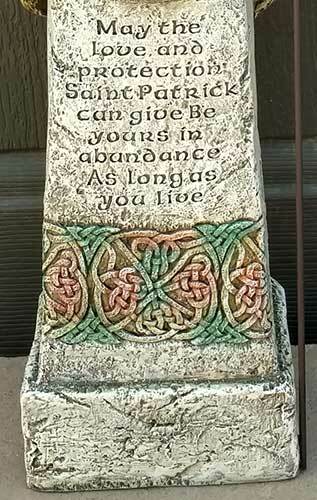 Standing Celtic cross is a small pewter design that is enhanced with The Irish Blessing along with knot-work. 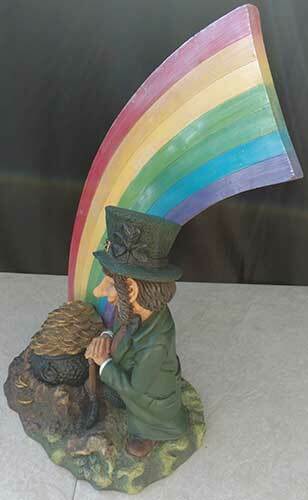 Irish figurine is Gael Ore, a Declan's Finnian leprechaun, who has dug up his pot of gold at the end of the rainbow. 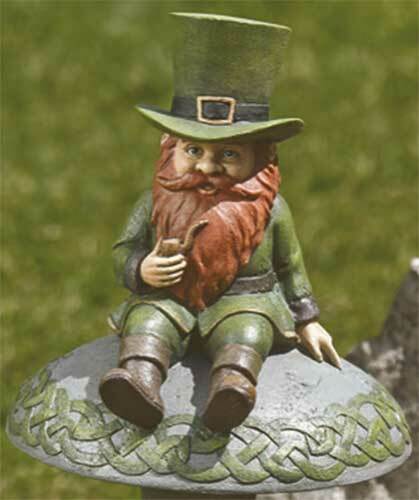 Due to the weight and size, this Irish figurine ships separately and ONLY by ground freight. Typical delivery is 5 - 7 days. 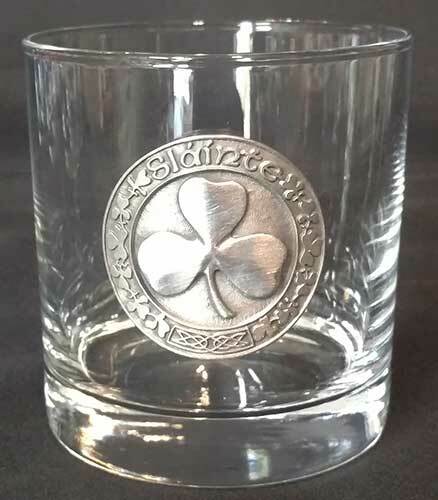 Irish whiskey glasses feature pewter Celtic cross emblems that are enhanced with interlaced knot-work. 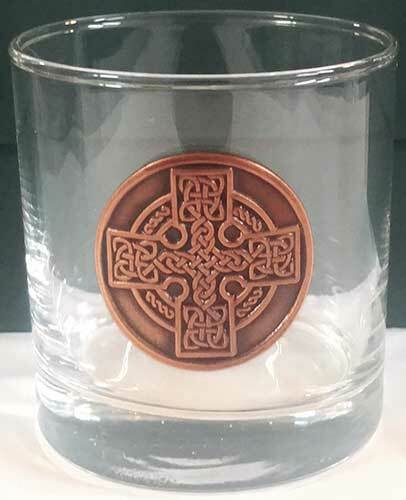 Irish whiskey glasses feature copper plated over pewter Celtic cross emblems that are enhanced with interlaced knot-work. 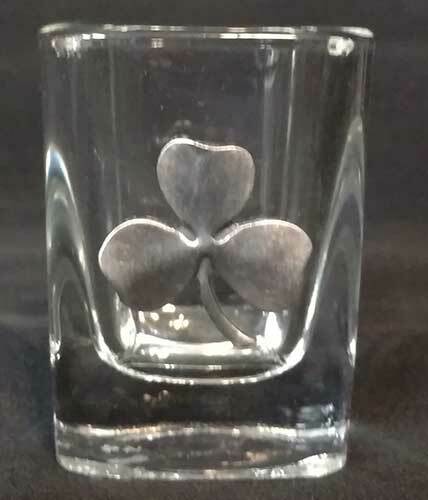 Irish whiskey glasses feature pewter emblems with the iconic shamrock. 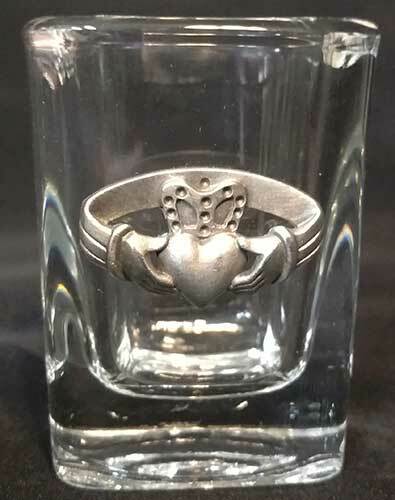 Irish shot glass set features pewter emblems with the iconic Claddagh, Ireland's symbol of love, loyalty, friendship. 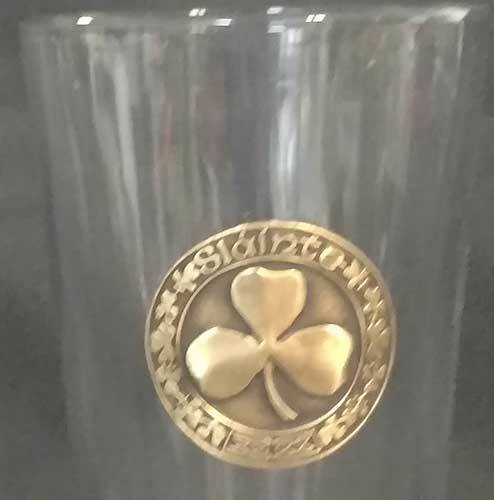 Irish whiskey glasses feature brass shamrock emblems. 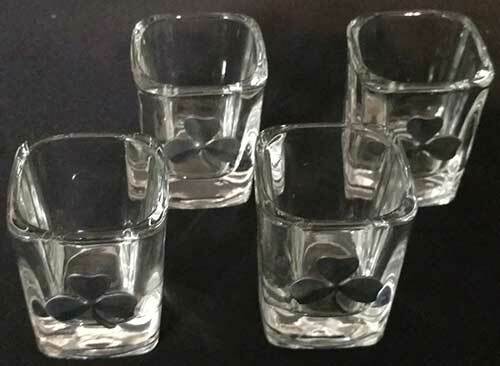 These shamrock glasses are ideal for mixed drinks or for whiskey highballs. 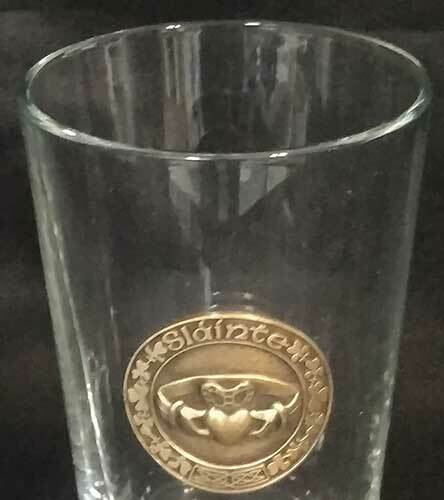 Irish whiskey glasses feature brass Claddagh emblems. 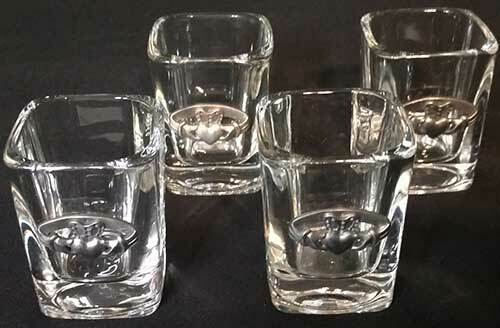 These Claddagh glasses are ideal for mixed drinks or for whiskey highballs. 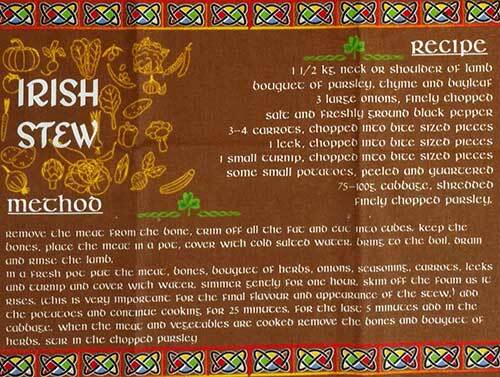 Irish tea towel features three famous Irish recipes along with shamrocks and Celtic knot-work. 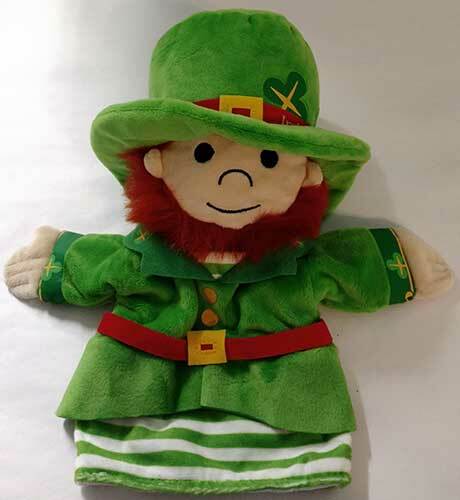 Leprechaun doll is a hand puppet that is suitable for both children and adults. 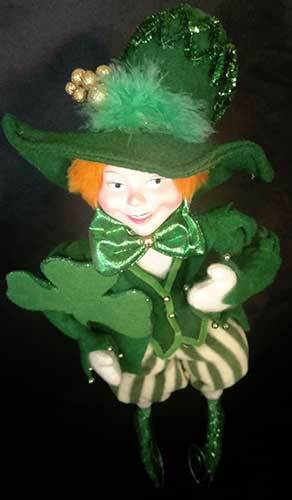 Irish decoration is a wild looking leprechaun that features a shamrock along with an over-sized hat. Irish clock features a ring of green neon light. 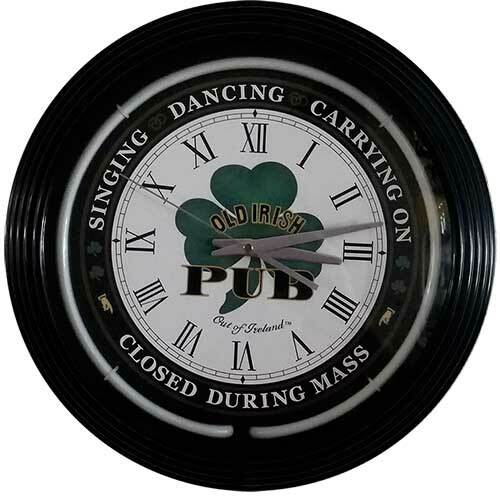 The neon Irish pub clock would be ideal in any room of your home. 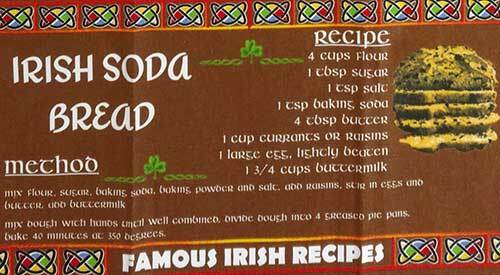 We just added a new page to our site, Speak Irish, where we have some popular Irish words and phases in Gaeilge, along with their pronunciation and translation in English. 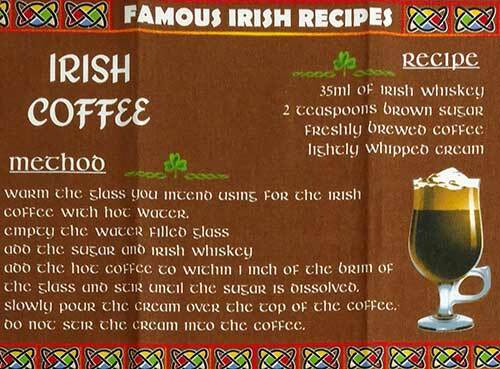 Take a look at The Irish Gift House BlogSpot for more about Irish legends and Celtic traditions. 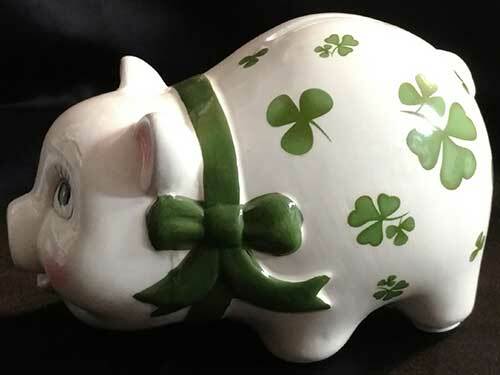 Our newest posts include Irish sixpence for her shoe and W B Yeats - Horseman Pass By along with The Flight of the Earls and our favorite Irish symbols. 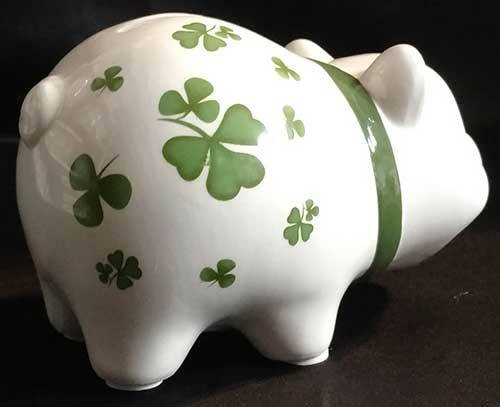 You may also take a look at some older posts that include the ironic twist of fate belonging to the popular Irish flat caps and a poem about the famous Shillelagh.